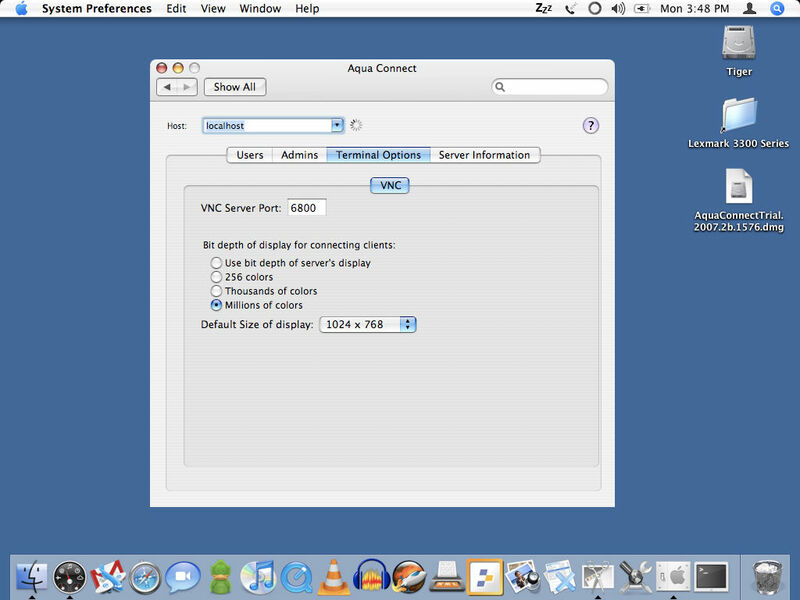 In the previous blog entry I wrote about Aqua Connect Terminal Server for Mac OS X. While I think it’s a great application for an organization that can afford to implement it, I cannot. I’m sure there are others out there wanting to implement terminal server functionality but can’t afford to pay for a proprietary product either. If you are one of those people, I have great news for you! You can do it right now, for free! All it will take is a Mac with OS 9 or later (I am running OS 10.4.11), Vine Server, a little time and maybe a few groans here and there. But hopefully, this tutorial will get you up and running without going through the moans and groans that I did! Let’s get started. The first task that we’ll take care of is setting up users. I am using a fresh installation of Tiger but you may not be. The first user that I would recommend setting up is an Administrator account. This is simply an account named “Administrator” with administrator privileges. This is an optional step but I find that it lessens the confusion of system administration. It also gives you an account that you can use to login to the machine you are setting this up on without disturbing a session of another user or your own. Once you have multiple users set up you need to enable fast user switching. Either click on the System Preferences icon in the dock or from the desktop click on the Apple icon and then System Preferences. Once the preferences panel has opened go to Accounts. Look for a button labeled “Login Options” and click on it. If you cannot click on the button you’ll need to un-lock the system for changes by clicking on the lock at the bottom of the panel. Once there you’ll want to make sure that “Automatically log in as:” is unchecked. 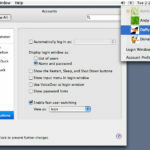 Under “Display login window as” I would recommend selecting “Name and password.” This way if someone happens to connect to your system through the network they will not see a list of your user accounts, which will give them half of the information they need to gain access to your system. The very last option is a definite necessity, check the box beside “Enable fast user switching.” The “View as” option is your own personal preference but I personally like the icon since it doesn’t take up so much of the title bar. Vine Server does have a system server but I do not recommend using it because it interferes with the functionality that we are trying to achieve. Instead, we will use the system VNC server. To enable it stay in System Preferences. Click on Show All at the top to return to the main panel. From there click on Sharing. 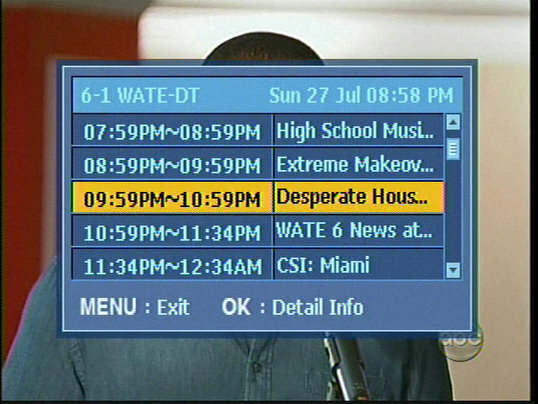 Click on Apple Remote Desktop. 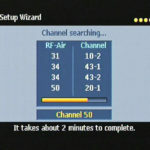 The service will start and you’ll need to assign a password in the section “VNC viewers may control screen with password.” You do not have to configure each user account with permissions. 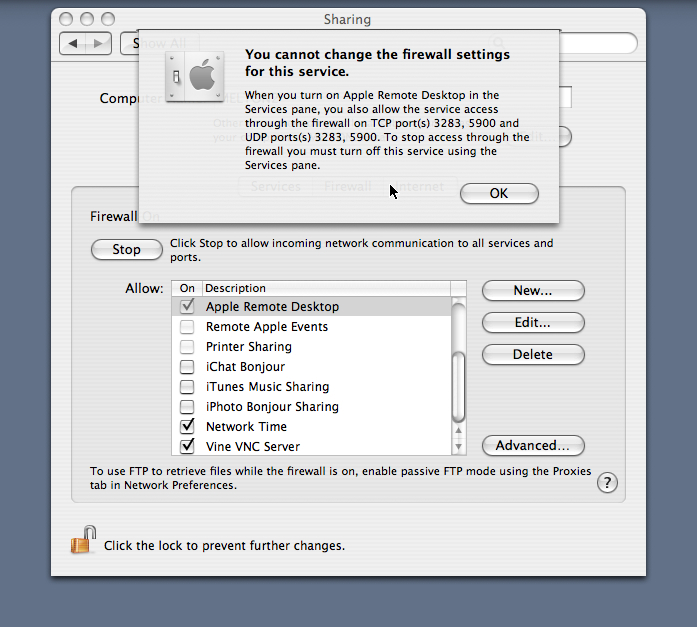 The permissions at the top of this screen are for Apple Remote Desktop software connections only. If you are going to want your users to connect using SSH (great for security) you’ll want to enable the Remote Login service in the Sharing panel as well. Next we’ll configure the firewall so your users can connect remotely. From the Sharing panel click on Firewall. Make sure that “Apple Remote Desktop” and “Remote Login – SSH” are checked. They should already be enabled. If not, simply select the check box beside them. Next, we need to allow connections into Vine Server (which we will install next). Click on New. Choose Other from Port Name. In the TCP Port Numbers field enter: 5800-5809. In the UPD Port Number enter: 5800. 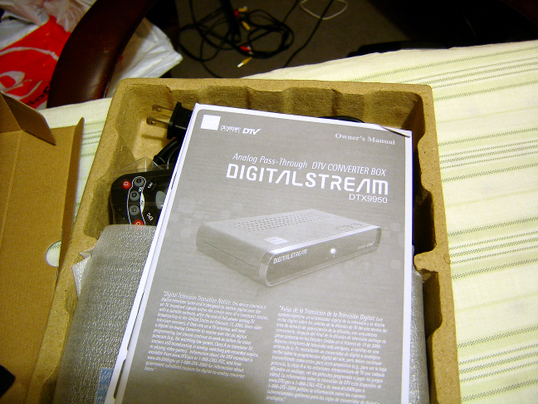 In the Description enter: “Vine VNC Server”. 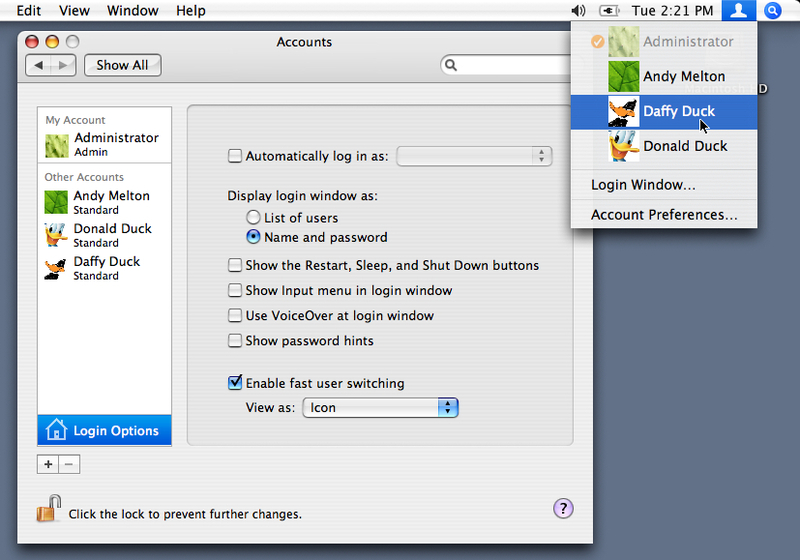 You can now close system preferences. Next you’ll want to login to your Administrator account (again, this is just a personal preference) and install Vine Server. After you have installed Vine Server log out of the Administrator account and log into one of the other user accounts that you created. Inside of each user account do the following: Launch Vine Server from the Applications directory. You’ll be asked to either enter a password or choose none (no password required). I would recommend using the same password that is assigned to that user account. Now, to make sure that Vine launches at log in. 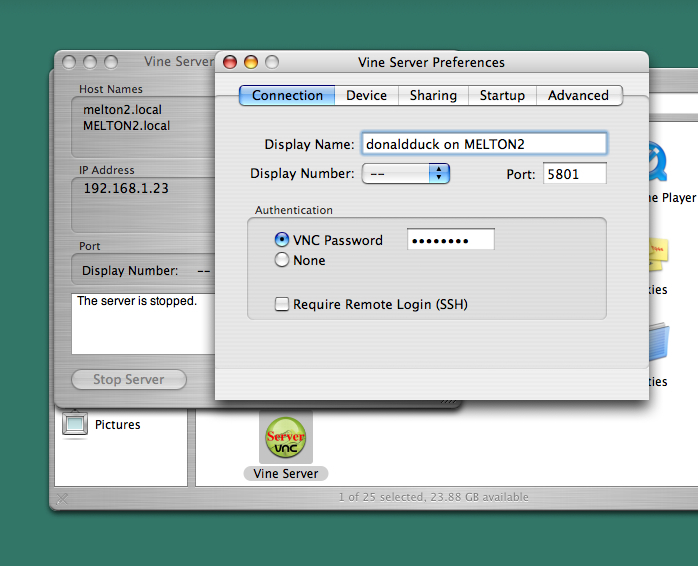 Right click on the Vine VNC icon in the dock and select “Keep In Dock”. Right click on the icon again and select “Open at Login”. We’ll need to make some changes to the Vine Server. 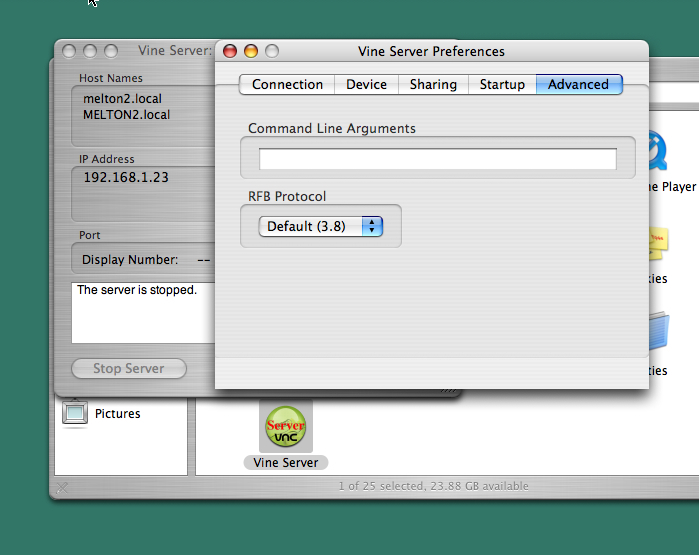 From the toolbar click on Vine Server >> Preferences. The first thing you will enter is a display name for the connection. I like to use “username on machinename.” This is for organizational purposes so whenever I connect to the server from a remote machine multiple times I will know which account I am in. 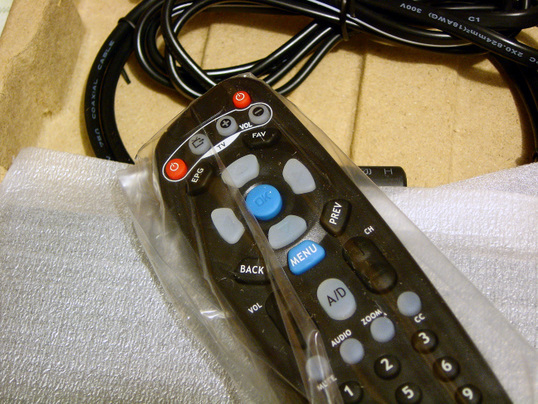 We now need to configure the port. 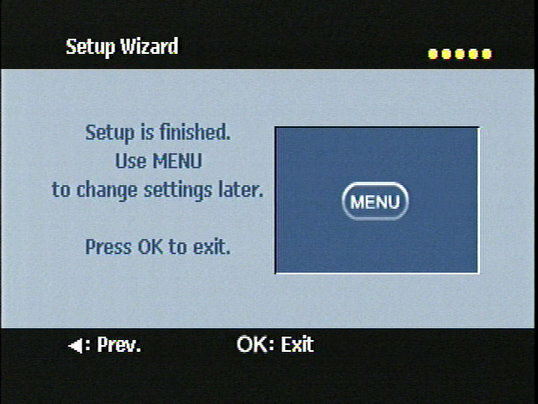 Since we’re also running the system VNC server we cannot use the default ports. This is why I had you to add those ports in the firewall. Otherwise, we could have used the standard VNC option in the drop down menu. You can use port 5800 for this first account but I prefer to use port 5801 for the first user account, 5802 for the second, 5803 for the third and so on. Again, it’s a personal, organizational preference. 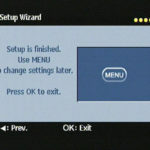 Before you continue you can also choose whether you want to require users to connect via SSH before they can make a VNC connection. Generally, on a local network I don’t require users to connect via SSH. 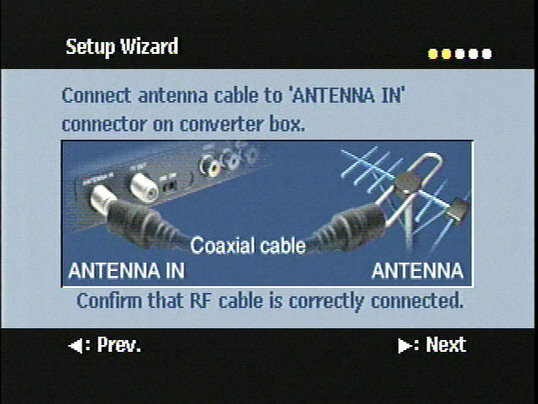 If a user was connecting remotely, I would. Let’s switch to the Device tab. Since this machine will be used by multiple users we want to make sure that it will not go to sleep. We also want to make sure that the screen saver is not running. Running a screen saver over VNC will make everything on your network extremely slow. Make sure those check boxes are not checked. Lastly, make sure that “Stop server on a fast user switch” is unchecked. Otherwise, when you log out you won’t be able to connect again unless you use the system server VNC connection to log in. Configure all of your users with these settings and reboot the server. 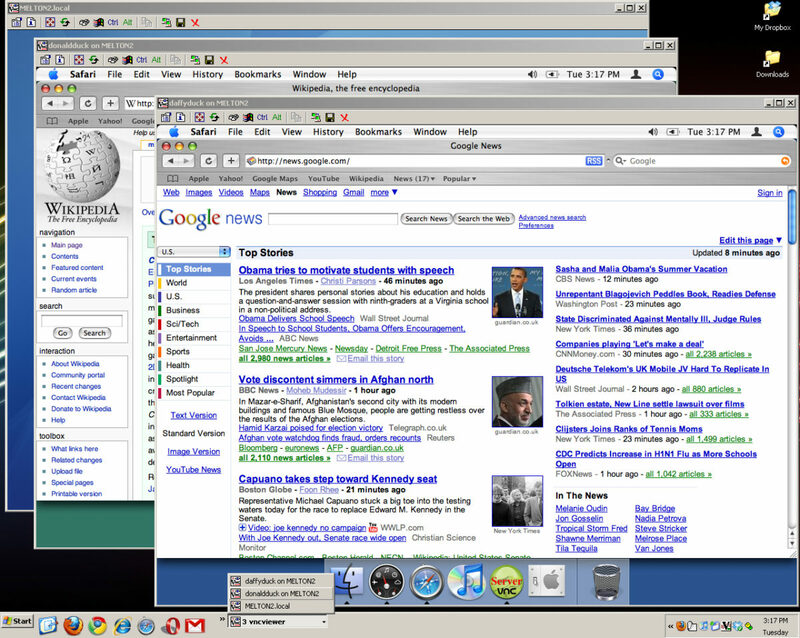 To connect to the system VNC server you’ll need a VNC Viewer. For Windows I recommend TightVNC Viewer. 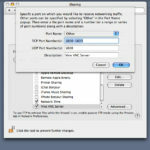 If you’re using Linux use Vinagre or TightVNC. If you’re using a Mac you can use Chicken of the VNC. 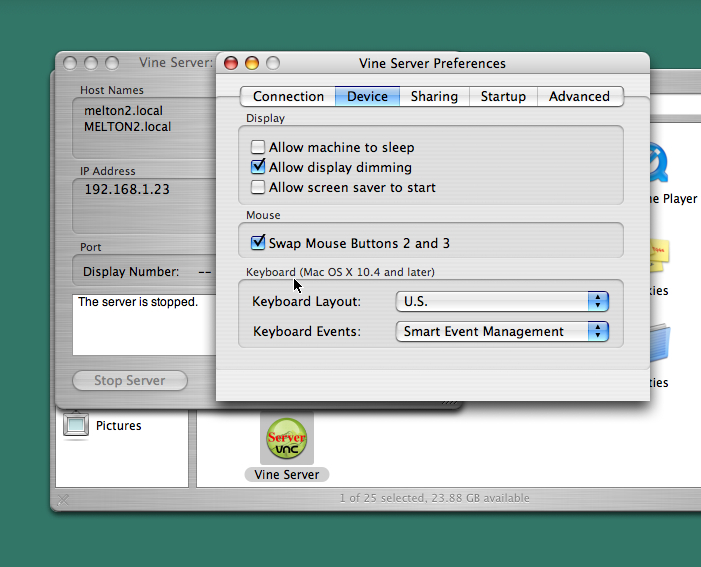 Testplant has a VNC viewer called Vine Viewer that you can purchase for added functionality. 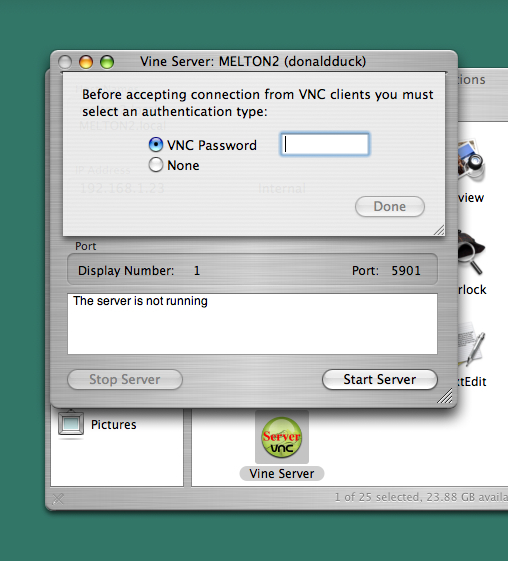 Once you have chosen a VNC viewer, open it and enter the IP address of the Mac you are setting up as a terminal server and connect. 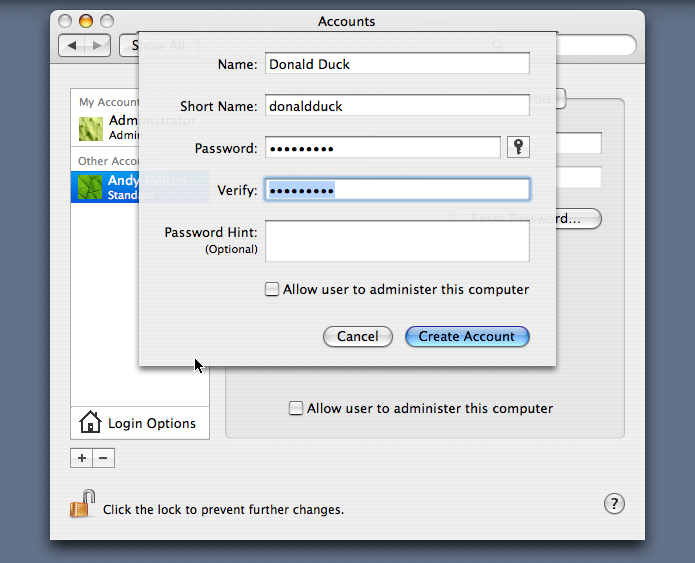 You should be asked to enter the password you entered in the Apple Remote Desktop settings. Enter the password and you should then see the log in screen. Now all you have to do is log in to each user account so that each account has Vine Server running in it and return to the log in screen using fast user switching. Make sure that you don’t log out or you won’t be able to connect to the VNC server that is running inside of each user account. After you have finished starting up Vine server in each user account and have returned to the log in screen you can disconnect from the system server. 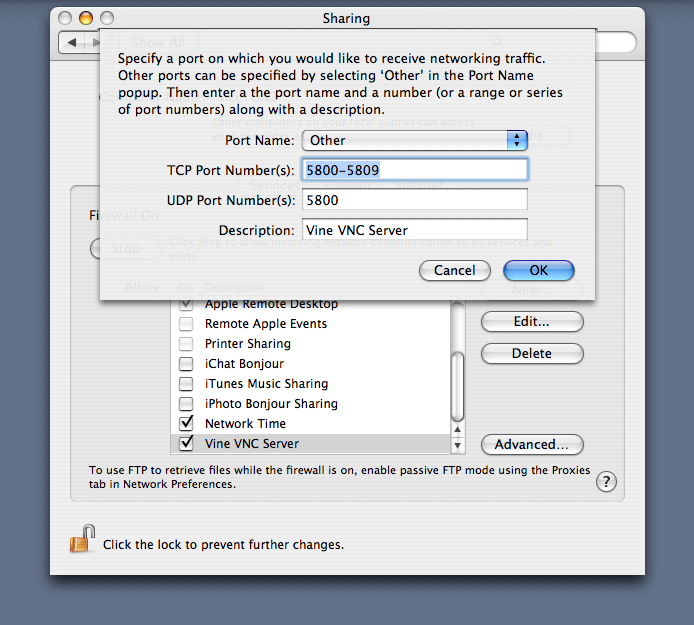 To connect to the user VNC servers the only change you will make in your connection process is the IP address in the VNC viewer. This time you will enter the IP address of the server followed by a colon and a port number. 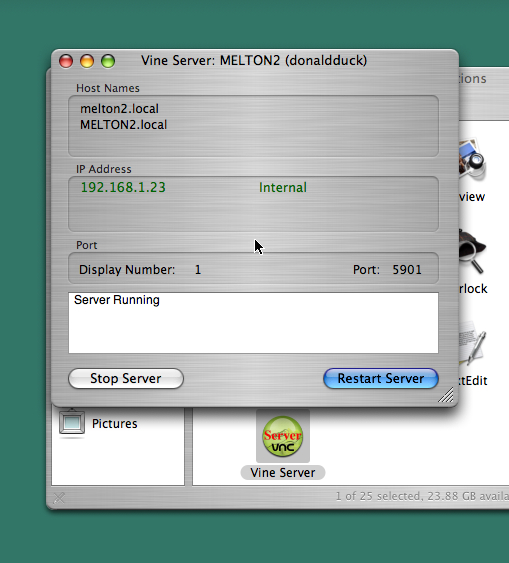 Example: 192.168.1.23:5801 – This will connect your VNC viewer to the first user account in which you launched Vine server. You’ll be asked to enter the password that you specified in that user account. No, this is not a true terminal server. However, if you need this type of functionality and are not willing to pony up the dough, I think this is a great solution. At least, it’s the only solution I have been able to come up with! 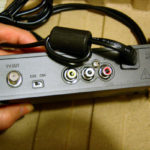 I think my next experiment will be to see whether I can achieve better performance with it using a FireWire connection. 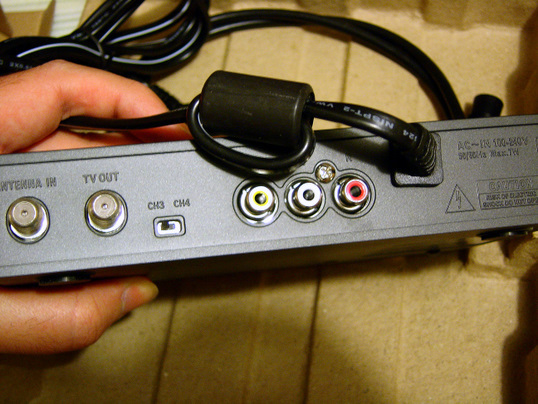 I’ve got to get the FireWire 6 pin to 6 pin cable first. I’d also like to eventually have a dumb terminal connecting to the server to display the Mac OS X desktop. A few years ago I fell in love with Windows Terminal Services Server. Then I learned about the Linux Terminal Server Project (LTSP) and fell in love with it even more because I could bring old computers to life by booting them over the network with a brand new, full-featured, modern operating system. I love the idea of terminal computing because it gives you the ability to connect from any workstation and access all of your applications and data from each workstation you connect from. 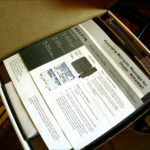 Businesses, schools and organizations can implement terminal computing as a way to give more users access to a computer without having to purchase a complete computer workstation for each user. Since setting up a Windows and Linux terminal server it has been a dream of mine to get a terminal server up and running on Mac OS X. It’s a topic that I will occasionally do a Google Search for to see if there are any new projects trying to accomplish this. A couple of weeks ago I was doing a search on this topic and found two software vendors that offered a solution. 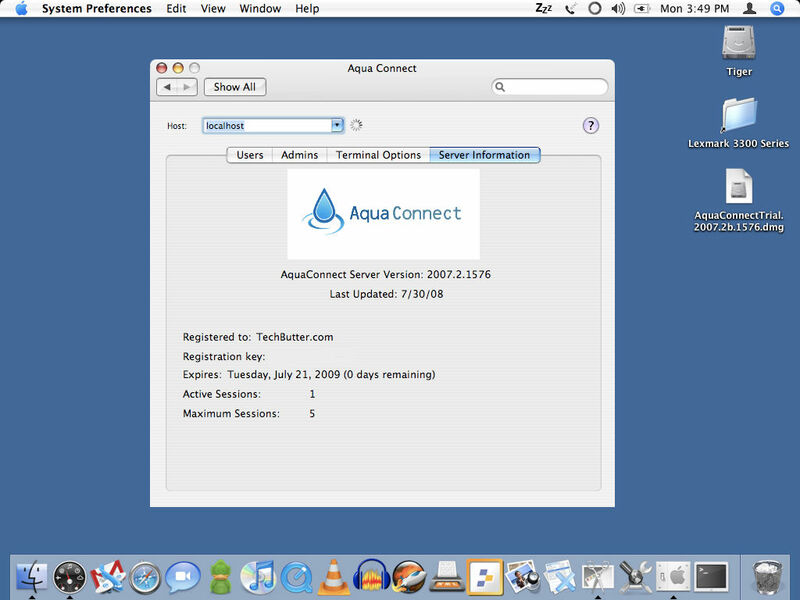 I decided to tryout Aqua Connect because it would run on my iBook G3. Yes, ancient technology but it still works and I use what I’ve got! 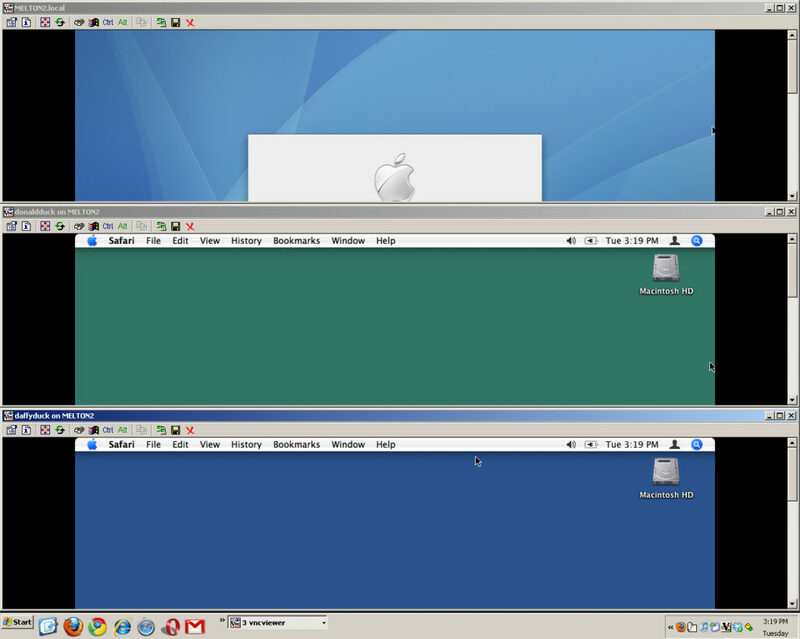 Taking control of a remote Mac is already possible with VNC server software and of course Apple Remote Desktop. 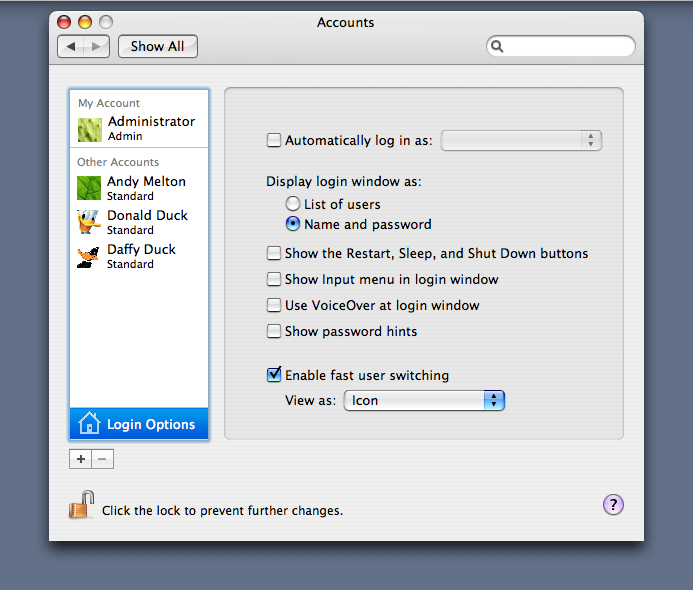 However, with a VNC server and Apple Remote Desktop only one user can use the system at a time. That is where a terminal server comes into play. Multiple users can connect to the terminal server at the same time from their workstation and use the computer they are connected to just like they were sitting right in front of it. 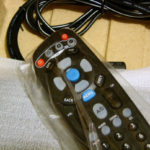 Each user can use the applications that they need to without disturbing other users. 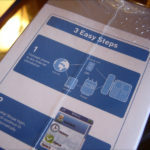 Once I found Aqua Connect I requested a free trial and about a day later I received the download link and a serial number. I downloaded the software and installed it. 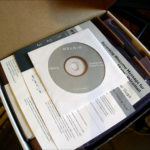 The software is extremely simple to install. 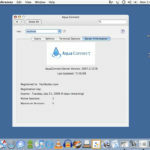 If you can install applications on OS X, you can install Aqua Connect. Installing LTSP is much more complicated so I was pleasantly surprised. 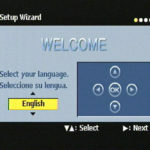 Once you get the server started, users added and a hole added in your firewall so the software can pass through it; you can connect from any computer on your network, using any VNC server client software (or a thin client that supports VNC connections). It’s that easy. Seriously? Yup! A couple of cool features in the Aqua Connect preference pane are the ability to control priority for each connecting client and the ability to set the default resolution of the connecting clients. As I mentioned above I was testing Aqua Connect on an iBook G3 which has Mac OS X 10.4 installed on it. 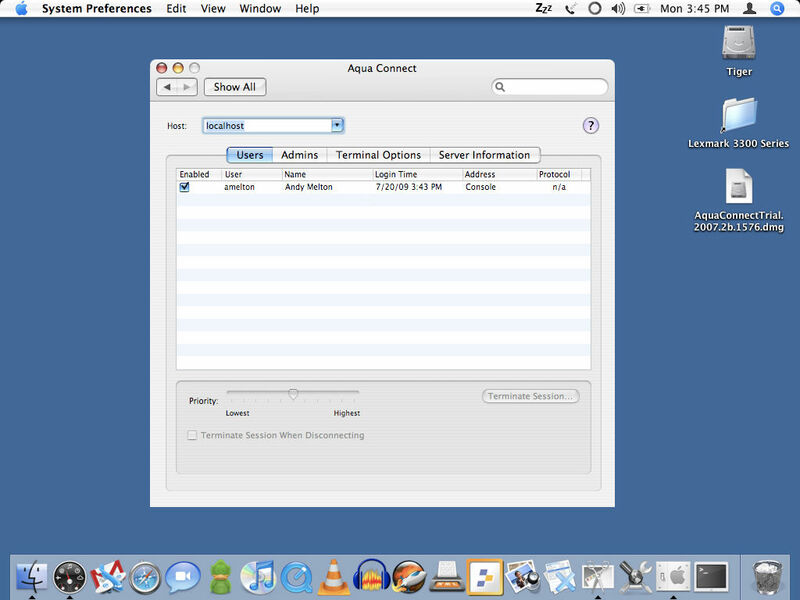 Aqua Connect is designed to work best on Mac OS X Server and of course a computer with more resources. 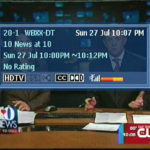 There are two versions of the software. One for OS X 10.4 Tiger and one for OS X 10.5 Leopard. The Leopard version has more features and unfortunately, I am unable to tell you about those as of this time. 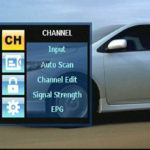 If in the future I am able to test the Leopard version I will update this article with updated information. I mention all of that so you can keep that in mind as you read the rest of this entry. 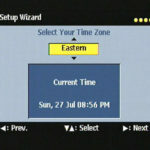 To connect to the server you can use any VNC client software (TightVNC Viewer, RealVNC, Chicken of the VNC, etc). The problem with this is that VNC is terrible for performance. For quick maintenance on a system it is okay but I don’t think anyone would want to browse the Internet or use many applications at a time due to the slow screen re-drawing time. Fortunately, the Leopard version of Aqua Connect supports connecting via RDP (remote desktop protocol) clients which should make the OS X terminal server experience a much more pleasant one. 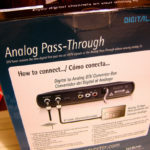 There were a couple of quirks that I encountered while testing Aqua Connect. The first is console lockups. After connecting and logging off multiple clients I would try to login to the server (the iBook G3) but could not enter any login credentials. It looked as though there was a remote login being displayed over the real login screen. 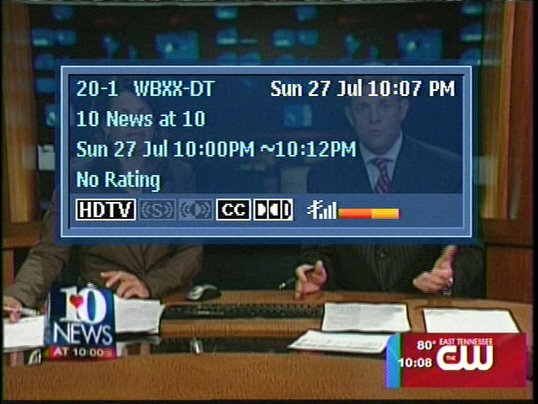 I don’t know if this was actually the case or not but the display had a much lower resolution than it normally does. 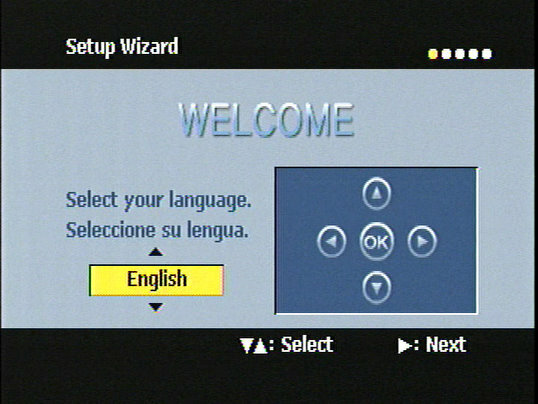 I could not interact with the console and had to reboot when this happened. The second quirk was that I would sometimes be unable to login to the terminal server from a remote client without rebooting the server first. I just assumed that these quirks were due to it being installed on the client version of Tiger instead of the server version. 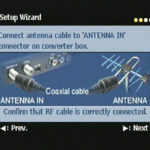 The alternative to Aqua Connect is iRAPP Terminal Server. 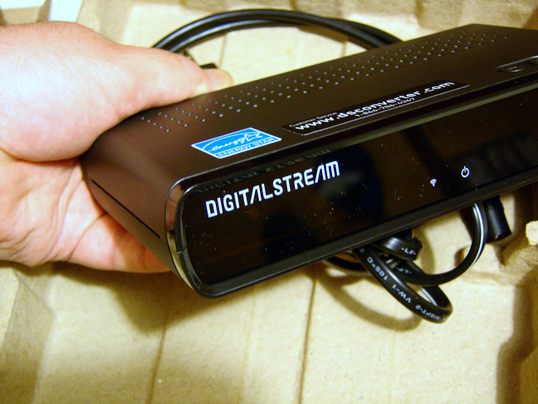 It looks like a really great solution as well but unfortunately, it only runs on Intel Macs so I am unable to test it. They are more up-front about their pricing, which I like. Their pricing for 20 users is $5256.00. One user is $262.80 (at the time of this writing). Both of these options are currently out of my budget, but, they’re definitely interesting projects to look at if you’re interested in terminal computing. I will be sticking with a simple VNC server since it accommodates my needs nicely. 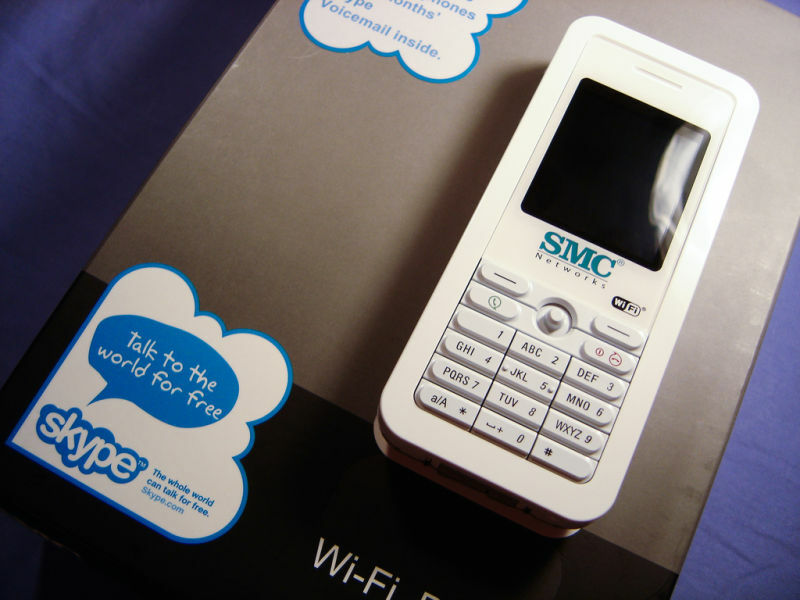 Last year I purchased the SMC WiFi Phone for Skype and was extremely disappointed. Haunted by it would probably be a better phrase. 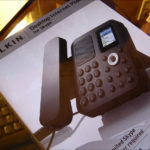 A reader of this blog by the name of Wayne gifted the Belkin phone to me. Thankfully so, because I was still needing a phone to use with Skype since I use it as my main line. I was still struggling with the same problems I faced when I purchased the WiFi phone. That is, I was never able to quickly answer Skype when someone was calling. I’ve had the phone for a couple of weeks now and have thoroughly tested it out. Fortunately, for the phone, I don’t feel like slamming it against the wall as I did with the SMC phone. With that said, it’s not perfect. 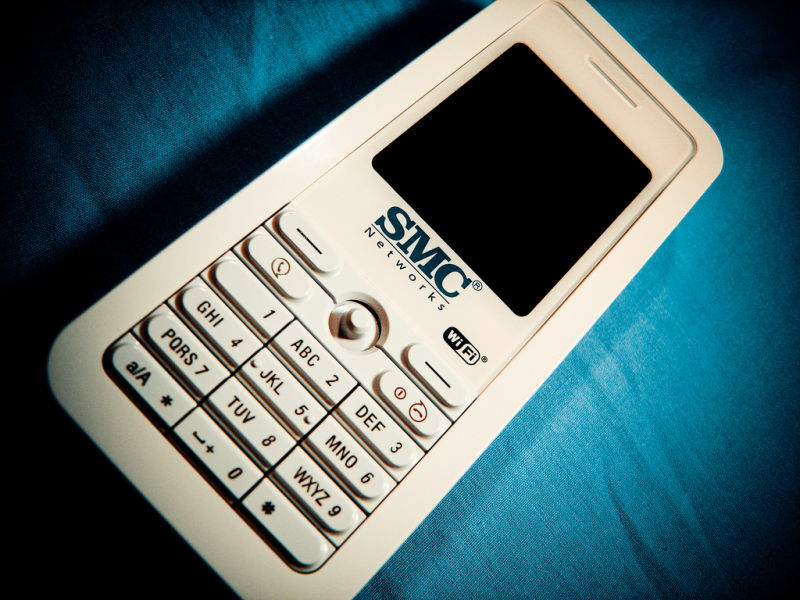 However, it’s been a much more pleasurable experience than the SMC phone. I think I’ll start this review off with reasons I like this model, problems I had with the phone and then we’ll get to my conclusion. Reasons I like this model: When I was looking at this phone on the Skype Store, I really liked that it was a desktop form factor. I have saw others in the past but they didn’t have all the features that this phone has. 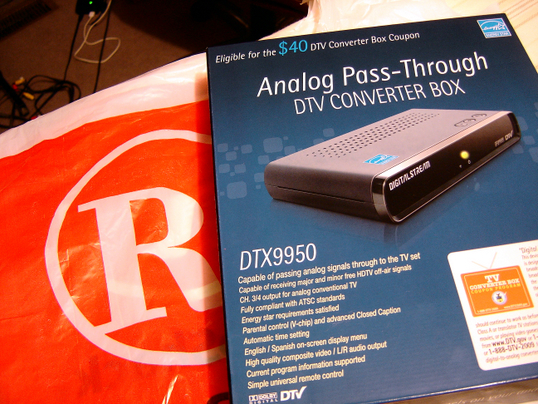 I liked that you could plug it into the network with an ethernet cable. I thought the call quality would be much better because of this. Others that I have looked at require you to connect the phone to the computer via USB. I wanted something fully independent. There are times that I’m working on video and still want to be able to talk on Skype. I also liked the fact that it had a full color display and speaker phone. Voicemail: I am really happy to report that voice mail works with this phone. That phone that I keep referring to, the one I hate so much, would never send a call to voice mail. 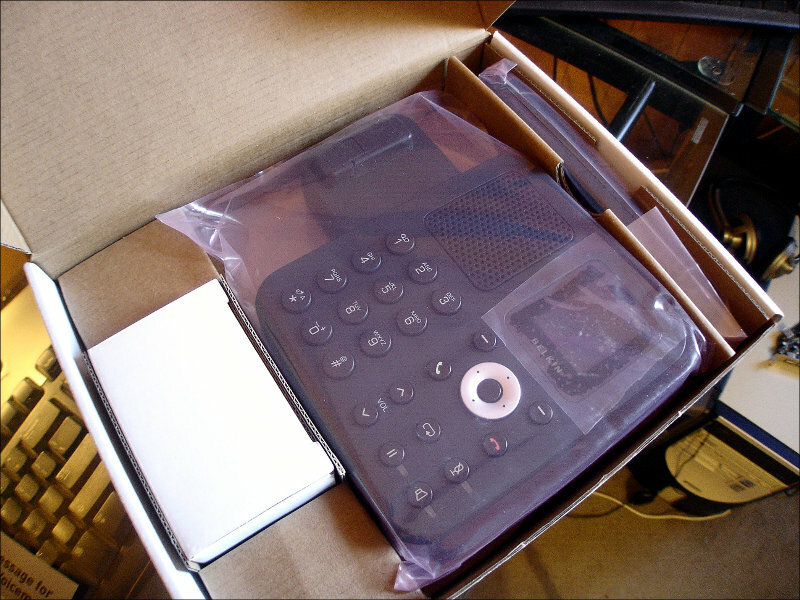 This phone will send it to voice mail after four rings. Speaker: Although I really don’t use the speaker that much it is nice to have. Sometimes I’ll use the speaker to listen to voice mails or to see if I’ll get a ring or busy signal to the person I’m calling. Web Based Administration: The only thing you can do with the web based administration is upgrade the phone’s firmware. However, the geek in me thinks it’s really neat. 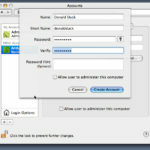 For added security you’ll want to change the default password so others cannot gain access to the administration area. One or the other! One of the biggest problems that I have faced while using the Belkin phone is that you can’t use Skype on the computer and the phone at the same time. Well, you can, but it causes a lot of problems. Instance 1: I was using Skype on the computer to talk to someone and I had my web cam on. I was mentioning to them that I had got the phone and they wanted to see it. I unplugged the phone from the network (thinking it would be no big deal) and showed it to my friend on camera. I then plugged the phone back into the network and Skype on the computer completely crashed. 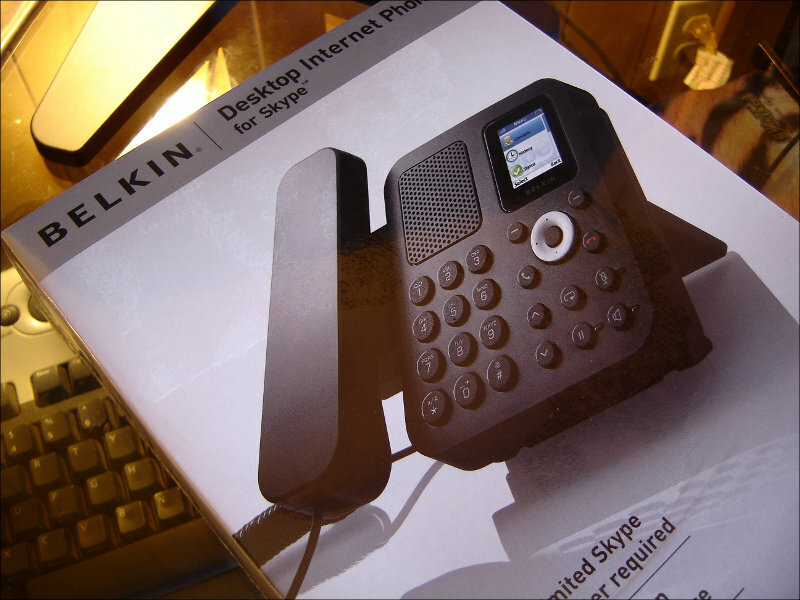 Instance 2: I was on a Skype call using the Belkin phone. I needed to grab a link that someone was trying to send to me in chat. So, I started Skype on the computer and the Belkin phone completely rebooted and updated it’s firmware. 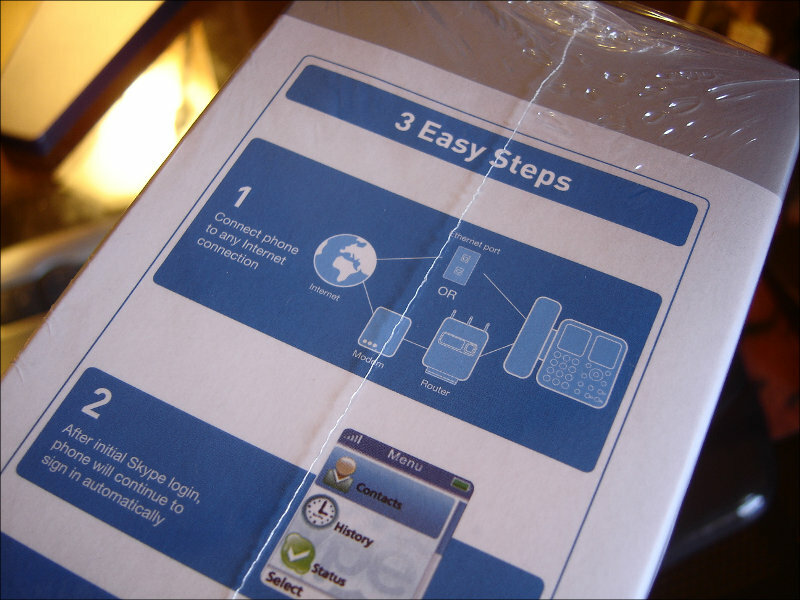 Instance 3: I had been instant messaging with a friend and knew that they were going to call me. When I know I’m going to be on a call for a while I’d rather use Skype on the computer because it’s much more comfortable than holding the phone. When they called me I had answered the call on the computer but the Belkin phone continued to ring a few more times. Quiet calls. A couple of people have mentioned that when I am talking to them and pause, that there is no background noise. “Are you there?” tends to rear it’s ugly head several times during the conversation. Only a couple of people have mentioned this, though. Call quality. The phone doesn’t have the absolute best call quality. Though, again, it’s definitely much better than the SMC phone. 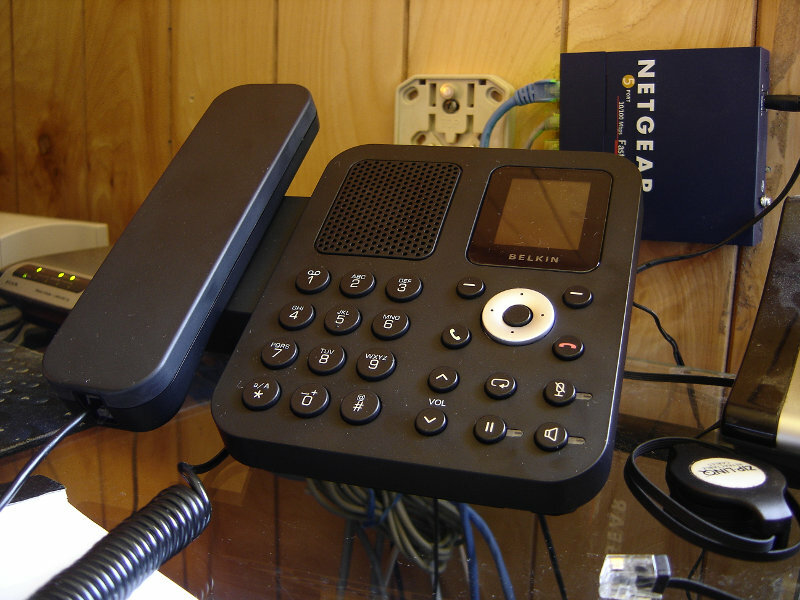 I have forwarded ports to the phone and it is directly connected to the DSL router (which has a firewall, if you were worried) to try and improve call quality. It’s not traditional telephone quality, it’s definitely not the quality you can get out of Skype on the computer, but, it’s not terrible. Conclusion. I really like this phone. It works and operates as a phone should. Although I did have a few problems with this phone (as mentioned above), it’s a really great phone. I think it would make a great gift. 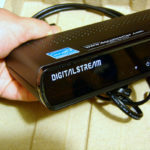 Buy one, set up a Skype account, add yourself to the contact list and give it away. 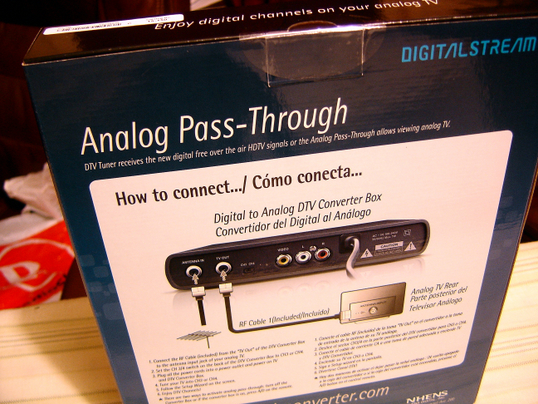 Just tell the recipient to plug and play. I hope to see many software updates for this phone in the future. Hopefully, they’ll figure out a way to improve call quality. 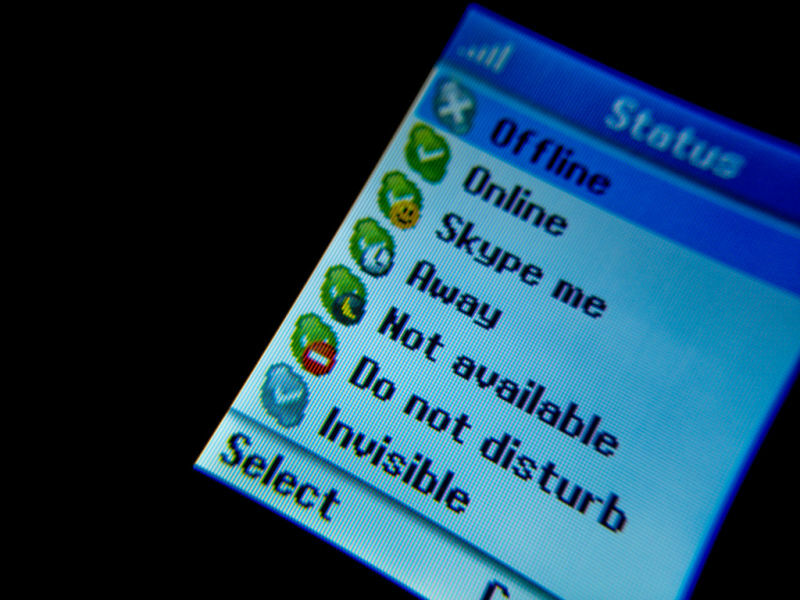 I would also like to see an addition to the embedded Skype software that makes it easy to silence the phone without going on “Do Not Disturb,” going through the settings and turning the ringer off or signing out of Skype on the phone. Signing back into Skype through the phone requires re-entering your password. Don’t get me wrong, I know it’s possible to silence the phone and it’s pretty simple to do. It just requires more clicks than I think there should be. Most importantly I would like to see an update that corrects the problem of using Skype on the computer and the phone at the same time. In a future model of this phone I would like to see the ability to plug in a headset. Would I recommend this phone? Most definitely. Like I said, it works as a phone should. 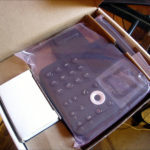 If you’re looking for a desktop Skype phone, this is the one to get. 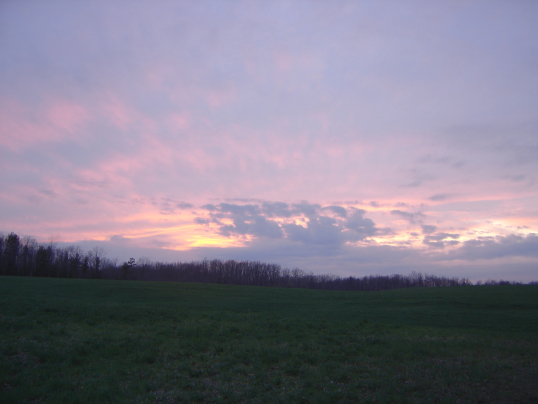 I have been seeing a lot of articles lately about high dynamic range (HDR) photography. I’ve always been fascinated by it. I read through a couple of blog entries and decided that I should try it myself. In the past I have said that I couldn’t do things like HDR due to the limitations of me only having a point and shoot camera. However, I have since learned that there is a lot that I can do with my camera it just takes a lot of practice, patience and a good eye. I went out and I took some photos and I wanted to make an entry about how I took the photos as well as show you how I got the final image. The images above are as follows. 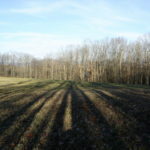 The first image is a photo of the scene taken at normal exposure. 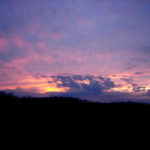 The second image is a composited image created from 3 images at different exposures. The last image is after adjustments have been made to the composited image to make it look more like what I saw while I was taking the photo. If you click on the photos you can see a larger version of each in a light box. The first thing you’ll want to do is to select something to take a photograph of, duh! 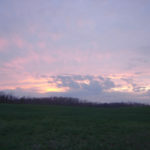 Taking photos using the HDR process is a little bit more time consuming. I’ve noticed that since I have been using this process I’ve taken photos of fewer scenes. This also means that I have taken better photographs because I’m thinking about what would look best in the final output image. Choose a scene that is not going to change for about 2-5 minutes. 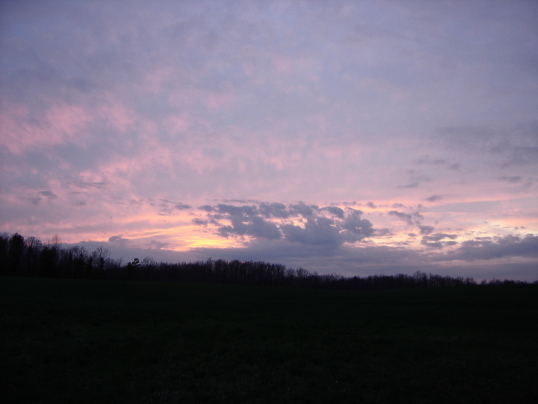 This time of course depends on how fast you can change the exposure of your camera to take the next photo. Some point & shoot cameras and dSLR cameras give you the ability to take photos at multiple exposures at the same time. If you have this feature you’ll definitely want to take advantage of it so you can take photos of objects that aren’t completely still. In the example below you’ll see an HDR image of the top of a tree. You’ll notice there is quite a bit of blur. Silly me wasn’t thinking about the tree moving whenever I took the photo. I think the photo is interesting but not of the highest quality. Shoot something that you have shot in the past but it didn’t turn out the way you had hoped. 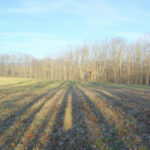 Look for shadows and anything that will have detail in the final image. Taking the photos at multiple exposure values will allow many of the details that you see with your eyes to come out in the final image. 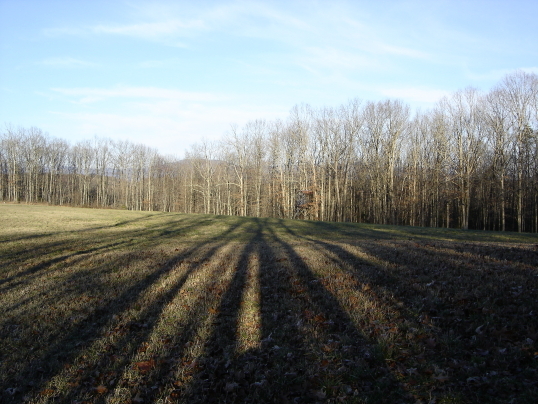 I like to look for shadows cast onto the ground, rolling hills or a gorgeous blue sky. Although my camera has a manual mode I have been taking my shots using “Program auto shooting” which on other cameras is called “Aperture priority.” Using this setting the camera gives me more options for adjusting the focus and fine tuning the capture options. Once in Program auto shooting I set up the scene: zoom, white balance, ISO, etc. I would highly recommend taking your photos in this mode or a similar mode on your camera since you have more control over the photos. Don’t use the auto mode, your photos will never turn out all that great in my opinion. 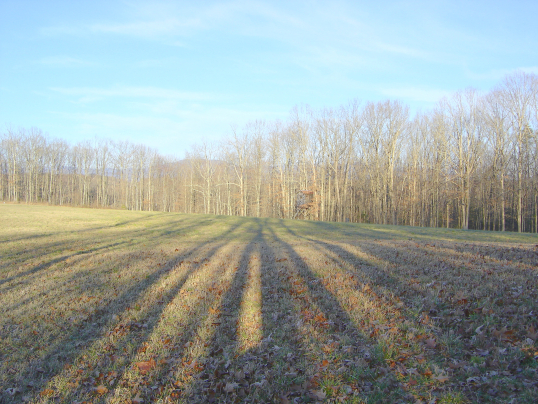 Look for a setting that allows you to change the exposure compensation. 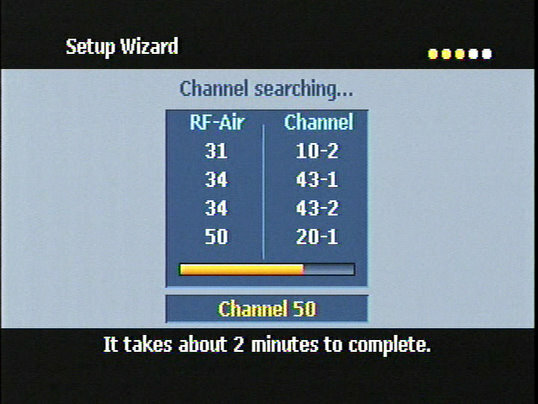 On my camera it is in the menu options and is called “EV.” Most cameras allow you to go all the way up to +2.0 and down to -2.0. In the several photos that I have taken and used the HDR technique I have found taking shots at 0EV, +1EV and -1EV is plenty. The more images you take the more likely the images will be blurred due to something in the scene moving. If you want to take your photos by adjusting the shutter speed have a look at this tutorial. Some cameras (even point and shoot) have a setting that will allow you to take multiple photos at different exposures at the same time. If you are lucky enough to have this on your camera take advantage of it. As you are taking a photo of each scene you might want to make a new folder on your memory card for each scene. This will allow you to organize your scenes a little better and keep the multiple exposures of the scene in the same folder. If you take multiple sets of photos of the same scene this really helps. Always shoot with a tripod. If you don’t have a tripod you’ll definitely want to get one. It is crucial. When you are shooting the photos at multiple exposures you’ll want to take a photo of exactly the same thing. During the compositing process the photos will be merged, any slight movement will show a blur. Along with using a tripod you’ll also want to use an auto timer of a few seconds to minimize camera shake. Once you have got the images off of your camera you’ll need to combine them. I am using FDR Tools Basic on Windows which is also available for Mac OS X 10.3.9 or later.. I am using the basic free version which seems to do really well. Another freeware tool for Windows is HDRShop or Qtpfsgui. Qtpfsgui also works with Linux or the Mac. 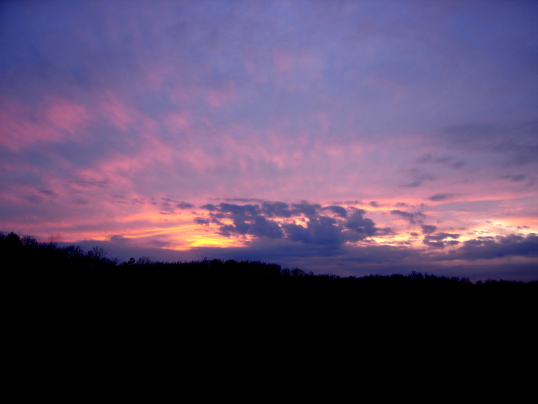 If you have Adobe Photoshop you can use the “Merge to HDR” function. To edit the final output image you’ll need an image editing tool. If you have Photoshop definitely take advantage of it as you’ll be able to work with more than 8 bits which will give you a better output image. Although the GIMP only offers 8 bits I’ve been using it to edit the final output image and getting decent results. If you don’t have Photoshop I would highly recommend The GIMP, since it’s free and works on Mac (using X11), Windows and Linux. 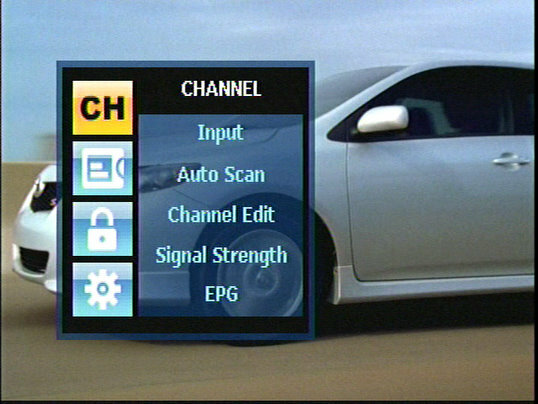 You could also use CinePaint which is capable of handling 8, 16 and 32 bit images. Open up FDRTools Basic, click on Images >> Open, navigate to your set of 3 images, highlight them and click on Open. FDRTools will then begin to put the images together. Once the images are combined you can tone map the image (tone mapping button at the top) but I’d recommend simply saving the image out as a JPEG and editing the final image in The GIMP, Photoshop, CinePaint or another program of your choice. Before you start editing the image that you saved out of FDRTools make a copy of it somewhere. On my computer I keep a folder for “Originals” and another folder for “Edited” photos. If you make a mistake or later decide you don’t like the adjustments you have made you can change them later. If you’re using Aperture, Lightroom, Picasa or another non-destructive editing program you won’t have to worry about this unless you are just a fussy person like myself who likes keeping things tidy! 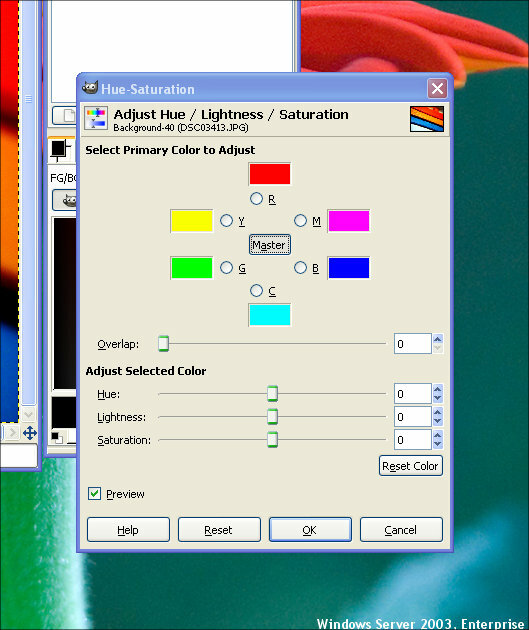 When you open the image in The GIMP it will ask you if you want to convert the image to the RGB working space. You should always work with your photos in the RGB color space so I always have the image converted from whatever embedded format the photo has. Once the image has been converted and opened the first thing I do is go to Colors >> Levels. Under “Input Levels” I move the sliders around until I get something that I like. You may have to add contrast or adjust the white balance but usually just moving the input level sliders around will give me a great result. Another quick way of getting the colors right is by adjusting the white balance. 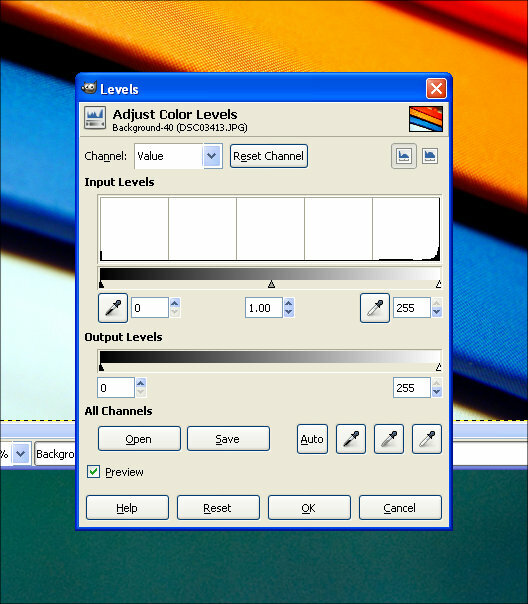 In the Levels dialog box select the “white” dropper and choose a white spot on the photo. Then choose the “black” dropper and choose a completely black spot on the photo. This is usually better than adjusting the levels with the input levels slider but sometimes it’s very hard to find a white spot on a photo. Once you have adjusted the image to your liking simply save the photo and share it! There are many groups for HDR photography on Flickr that you could join and post your images to and get tips on them for the next time. I recorded a video tutorial for this post which you can download a high resolution version of using the link below. If you prefer to stream the video tutorial use the Vimeo player at the bottom of this post. High Dynamic Range (HDR) Photography from andymelton on Vimeo. Since I got this iBook G3 I’ve been primarily using it for communication (email, instant messaging) and multimedia (audio podcasts and my music collection). Unfortunately, the iBook doesn’t have a great deal of power since it is running Tiger which is a bit more resource intensive than OS 9 which is what the iBook shipped from the factory with. Checking my Gmail account was extremely painful because with all of the browsers it took an incredibly long time to load the interface and every email that I would click on would load painfully slow. 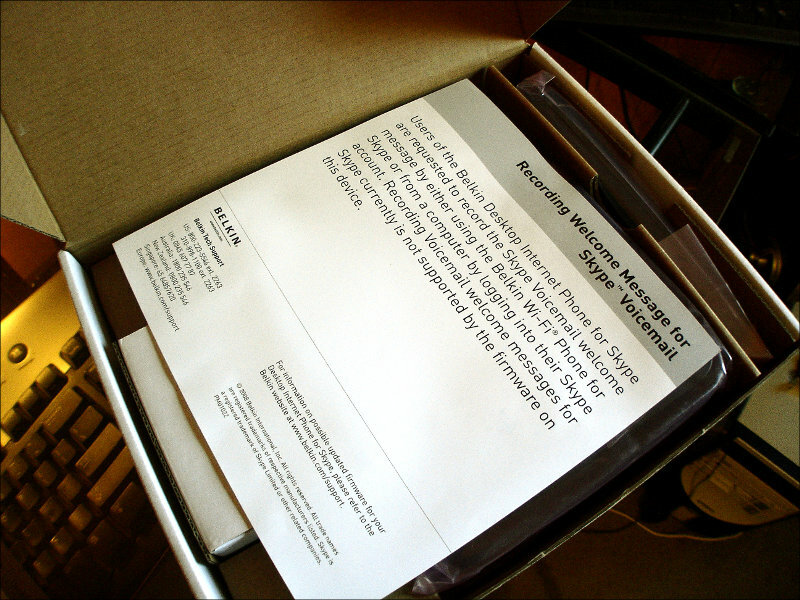 Fast forward a couple of months after getting the iBook I found an application called Mailplane. When I first saw the application I was extremely skeptical of it. I questioned why there was a need for such an application when I could simply load Gmail in a web browser and do everything I needed to do in the browser. I figured it was one of those applications that just made it easy for lazy people to gain access to their Gmail account. I didn’t sign up for the beta then but fast forward a couple of months and I got to wondering about it again. I signed up for the beta and downloaded the application. Immediately it hit me as to why this application was needed. Accessing my Gmail account was extremely fast using Mailplane. Accessing Gmail using Mailplane was much faster than accessing the account with a browser even if I was using my best computer. I am not an application developer but my guess would be that there is some sort of caching happening behind the scenes. There has to be because it is so fast! When I get an email I am notified in the menu bar of Tiger and if I want to go view the message I can simply click on the Mailplane icon and have immediate access to my email. Mailplane has other features but I will be honest with you, I don’t use them. The icon toolbar at the top of the application allows you to navigate your Gmail account, add stars, archive, access the online version of Google Talk, access your photos for sending via email. All of that is great but again, I don’t use them because I still primarily use the interface that is provided inside of Gmail. The only feature that is available that I will probably use in the future is the multiple accounts feature which I’ll be using once I get my domains set up with Google Apps (which is also supported by Mailplane). I don’t have a complaint about the application however I would definitely like to see the application upgraded so it can take advantage of the new features availalbe in the updated version of Gmail. I especially like the ability to easily filter my messages and would like to be able to do that using Mailplane instead of going to another computer to access my Gmail account to create filters. I realize that you can do filtering via the settings and I have been doing that ever since I got my Gmail account in 2004 but the updated version of Gmail allows you to “Filter messages like this” very easily via the drop-down menu in your message pane. The application is still in beta but I was able to purchase the application at a special discount since I was a beta user. I am not sure what the pricing will be once it is out of beta. I don’t regret purchasing this application due to the convenience it has added to using my Gmail account and I do recommend it especially if you are like me and have an older machine or hate having to wait on your Gmail account to load. I think the developer of Mailplane has done a tremendous job and I look forward to more updates. I’d also love to see the developer create an application like Mailplane but for Google Reader. That would be really useful, too! 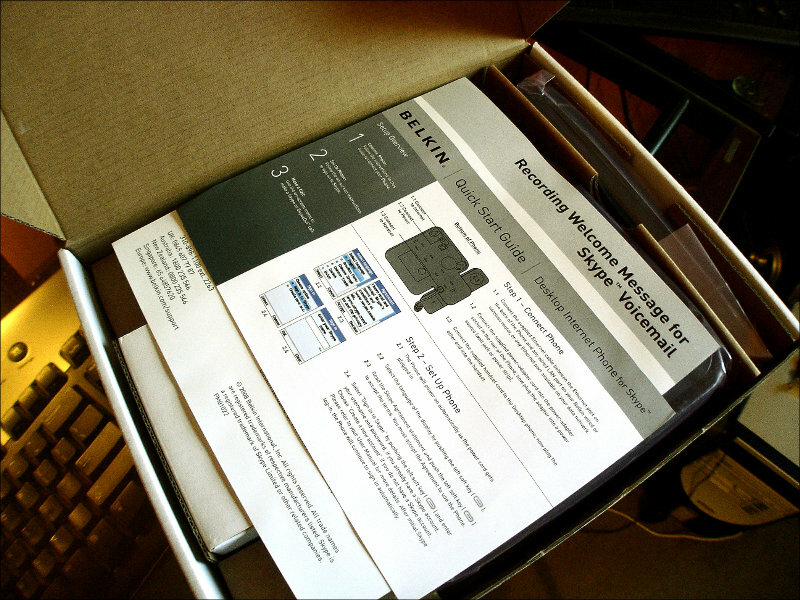 Article update: Sunday, December 2, 2007: The latest unstable beta of Mailplane that I just installed does take advantage of the latest version of Gmail 2.0. Thanks! Article update: Wednesday, October 1, 2008: I have updated this article with a screen shot from the latest version. 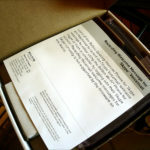 Since writing this article in November of 2007 the developer has made many improvements to Mailplane. When Gmail 2.0 was first supported it was very slow. 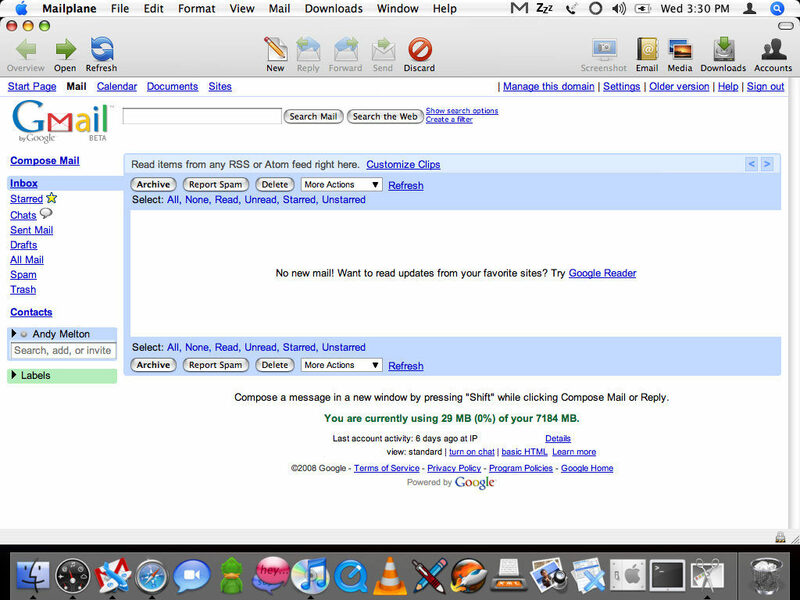 That has been improved and the application is much more responsive with the latest version of Gmail. For a while now I have been using the trial version of Adobe Photoshop Lightroom. The trial expired and it’s still a bit too much for me to pay for. 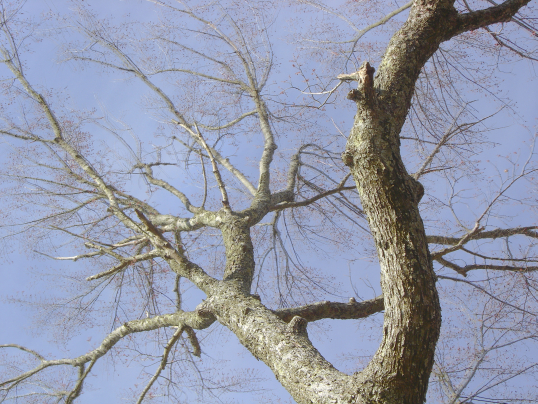 I love Picasa but it doesn’t have all the features that Lightroom spoiled me with while I was using it. Fortunately, there is The GIMP (Gnu Image Manipulation Program). It’s free which is the part that matters to most people. It’s got a ton of features and is comparable to Adobe Photoshop in many aspects. I’ve been using The GIMP on and off again since 2003. 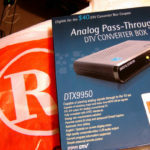 I have always wanted to switch to it because I love free and open source software. Unfortunately, I’ve never been able to completely switch because I haven’t taken the time to sit down and learn it. Fortunately, with the latest version of The GIMP I am able to say that it can become my primary photo enhancement/editing tool. One of these days I hope it will become my tool for creating web graphics, but that’s another post for another day. Although I am not very fluent with the GIMP for creating web graphics I have been using it for the past couple of weeks to enhance my photos before I upload them to Flickr. I don’t know how to do really cool effects, yet. Those will take time. But for the most part whenever I pull images off of my camera I really only need to do a few things like: increase saturation of individual colors, white balance correction, brightness/contrast and sharpening. Picasa from Google will do most of those but it doesn’t really allow you to fine tune color saturation like I was spoiled with while using Lightroom. Now, some people may think that it’s wrong to increase the saturation of colors in a photo but in my opinion I am going to make the photo look exactly like I remember it. Whenever I first open a photo to enhance the first thing that I do is use the auto white balance tool (Colors >> Auto >> White Balance). It’s a very quick and simply way of ensuring that your whites are whites. It’s like bleach for your photos. The great thing about this bleach is it’s color-safe, too! Ok. Seriously though it really does help, for the most part. A lot of times I will take a photo of an object, like a flower, on a white piece of paper with two desk lamps hovering above it. The two desk lamps have regular incandescent light bulbs in them and they generally produce a yellow cast in my images. Using the auto white balance the yellow cast is usually removed quickly and effortlessly. A lot of times when I pull images off of my camera and get to looking at them I think the colors are a little duller than what I remember the object I took the photo of being. In actuality it may not have been but what I remember isn’t what I’m seeing so I want to correct these. By going to Colors >> Hue-Saturation you can improve what you see by adjusting the hue of the color, the lightness and the saturation of the primary colors (red, yellow, green, cyan, blue and magenta). The lightness setting is really useful if you have a photo that came out dark and you have a photo where you really only wanted that color to stand out anyways. Increase it’s lightness value and optionally it’s hue and saturation and it will really stand out. I will caution you on one thing. Don’t use too much saturation. One obvious reason is that your image will wind up looking fake (leaves are generally not neon green!). Also, if you increase the blue too much you’ll notice it really quickly because you will start seeing spots in other parts of your photo where you didn’t even know there was blue. The same holds true for any color. Just be realistic with this tool. In my opinion as long as it looks good and is believable then it’s okay, unless of course you want neon pink grass! 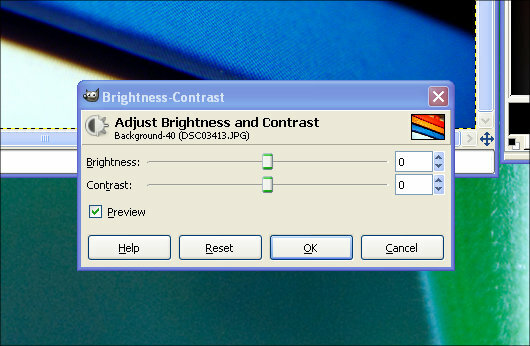 Before I talk about contrast I want to say something quickly about brightness. I don’t use the brightness tool of image editing applications a whole lot. I do, just not often. I only use it in extreme cases. I find that when I use the brightness tool that my images become too grainy to be accepted by my extremely critical eyes. Also whenever I use the brightness tool I find myself quickly adding more contrast to a photo. I try to avoid the brightness tool. You however may have different opinions on this so experiment with it. Using the contrast tool (Colors >> Brightness-Contrast) is something that I am very fond of. Adding contrast to an images is one of the quickest and easiest ways to enhance your photos. Adding contrast to a photo deepens the dark colors of an image while still allowing the bright colors to shine through more brilliantly. Let’s take a photo of a flower as an example. The flower petals are bright and beautiful but there is a slight problem, they aren’t as brilliant as we remember them. 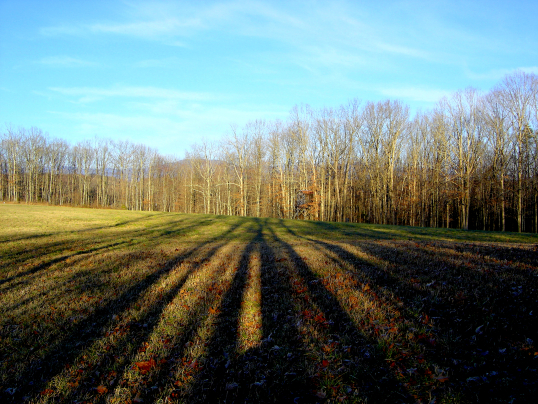 Adding just a little bit of contrast will help increase the beauty of the photo immediately. Again, this is something to use in moderation. Using The GIMP I generally start out with 5, 10 and 15 but try my best to stay under 15 if it’s at all possible. Play around with it though and see what it does. See what works best for you! When my parents were growing up the only option for photography was black and white. Now the default is color and you have to either buy black and white film or change your camera’s setting to black and white. I normally tend to only shoot in color and adjust the colors after I have taken the images off of my camera. That way I can decide whether I want the image to be in color, black and white, infrared, cyan or any other number of wacky color combinations. There are many different ways to change a color image to black and white using The GIMP. The quickest and easiest way is to click on Image >> Mode >> Grayscale. You can also click on Colors >> Hue-Saturation, making sure that “Master” in the center is selected and move the Saturation slider all the way to the left or enter a value of -100. Sometimes we are not able to capture an image as sharply as we remember. Fortunately for us sharpening is a standard feature in image editing applications today. 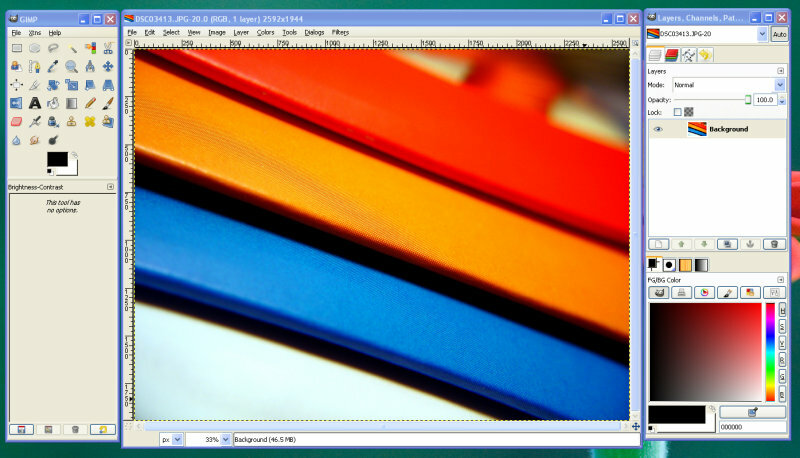 It’s a bit harder to find in The GIMP than you’d expect but it’s located at Filters >> Enhance >> Sharpen. In that same area there is another tool called Unsharp Mask that you might enjoy playing with. I won’t go into detail about sharpening images because that’s pretty straight-forward. 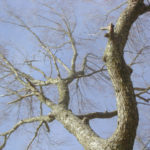 There are plenty of techniques you can use in The GIMP to sharpen an image, one in particular I am wanting to try out soon is called “Smart” Sharpening. 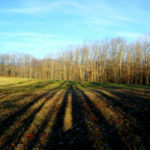 Another simple alteration that you’ll probably want to make on some of your photos is to crop them. Crop someone out or crop just the important part of a picture. Select the rectangle select tool from the tools dock (on the left by default), draw a selection of what you’d like to crop and adjust it to your liking and click on Image >> Crop to Selection and there you have a cropped image. Remember to not crop your images too much or when you print them you won’t have enough of an image to stretch out across the paper and the image will be blurry or pixelated. Along with cropping an image you’ll probably occasionally have to rotate a few of them. That’s very simple as well. Go to Image >> Transform and choose which direction you would like to rotate your image. I realize that this tutorial is fairly basic. I wanted to write it because when someone new to photo editing opens a program like The GIMP they are blown away by all the features and options that it offers. My hope is to give you a few tips that you can use to jump into The GIMP and start editing your photos. I think once you do jump into the program you’ll start to learn more about it. You’ll find many other tutorials online and like I said, I’m still learning it as well so when I learn something new I will be writing a new tutorial! One other thing I would like to suggest is to make sure you follow my advice for backing up your digital media collection. What I have been doing is pulling photos off of my camera, copying the ones I like and want to edit into another folder. If I edit them there and save them and later decide I don’t like the change that I made I can go back and retrieve the original photo and adjust the photo again. When you do save an image, make absolute certain you are saving the image at the highest quality possible. The GIMP defaults to something in the 90-98 quality range. If you’re uploading your photos to Flickr or going to print these photos, increase the slider to 100% and save it as the default. Also, make sure that you go to the advanced options to make sure the “Save EXIF data” option is checkmarked. This is one really great thing about digital photos if you can get the exposure, time/date, frame, camera model, etc from the data saved in the file. Make sure this data is retained! Basic photo enhancements with The GIMP from andymelton on Vimeo. A couple of weeks ago my younger brother asked me to buy some songs for him from the iTunes store. So I thought this would be no big deal. Normally I buy, download and burn the songs to a CD and also put them onto his iPod shuffle for him. Well, that wasn’t the case this time. I had some issues and thought I would share them. The music was bought and I transferred it over to my PC because the iBook doesn’t have a CD buner. No big deal. I get the tracks into iTunes on the PC and put them into a playlist and click on burn, no luck. There is an error that it can’t find a burner. The drive was being recognized by Windows as well as Nero. I got to thinking about it and I decided to disconnect the hard drive that was also on the same cable as the CD/DVD burner. Ok, first of all. I know it’s probably not wise to do that but I needed to connect the drive to the computer and it worked, so shush! Anyways. After taking my computer case apart, unplugging the hard drive and getting it all put back together again I turn the PC on and I still get the same error in iTunes. The drive is still being recognized by Windows and Nero but not iTunes. I then realize that Nero is not displaying the drive as a CD or DVD Burner. I don’t know what the deal with that was. I’m still having issues copying CDs or DVDs. 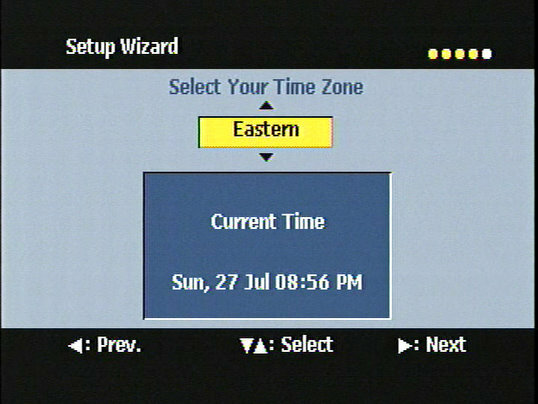 I’m thinking that I’m either needing to re-flash the optical drive, re-install Windows or buy a new DVD burner. But anyways. That’s not why I am writing. Once I finally got the music over onto the PC and found out that I was not going to be able to burn the music using iTunes, I needed to try and burn it using Nero or something else. Of course you can’t do that without removing the DRM from the music! So I found myFairTunes, a Windows only application. 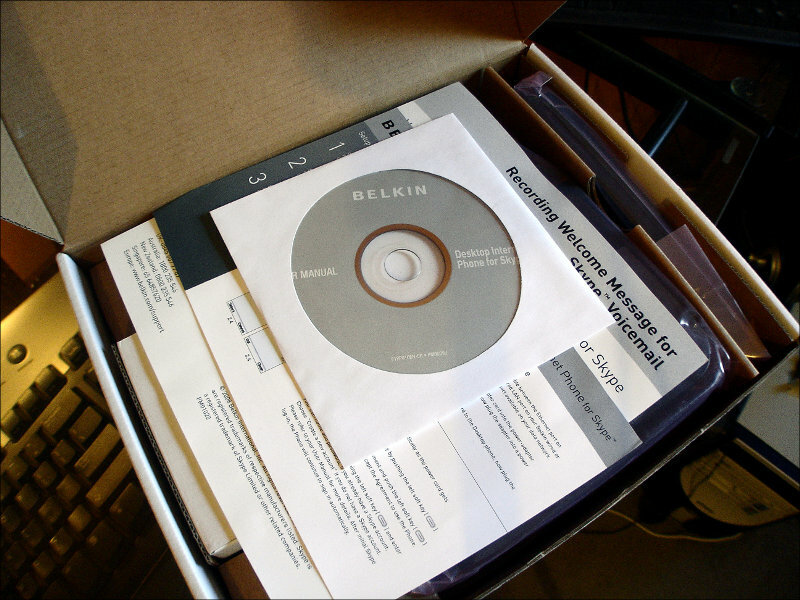 DRM Dumpster does the same thing for Mac users but you’ll need a CD-RW drive and disc. Also, the software is not free. I removed the DRM, converted the tracks to MP3 format in iTunes and tried to burn the music using Nero. Of course I thought the music had burned succesfully because it went through the entire process and said it was successful. However, looking at the CD after it came out of the drive you can tell that there was nothing on the disc. When you put it into a CD player it makes the blank disc noise and when you put it back into a computer it says it is blank. My point to this entire entry is that DRM is only making it harder for people who actually purchase music. We all know that. However the music industry still does not understand that fact. Thankfully, iTunes is now offering DRM free music. Also, fortunately, there are amazing companies like Magnatune who are against DRM. Magnatune allows you share the music you purchase with 3 people and they also let you license the music for videos, podcasts and other productions under a Creative Commons license. 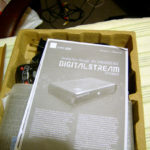 The issue I had isn’t the only reason DRM needs to be sent to the dumpster. People want to buy music players and put their music on it. 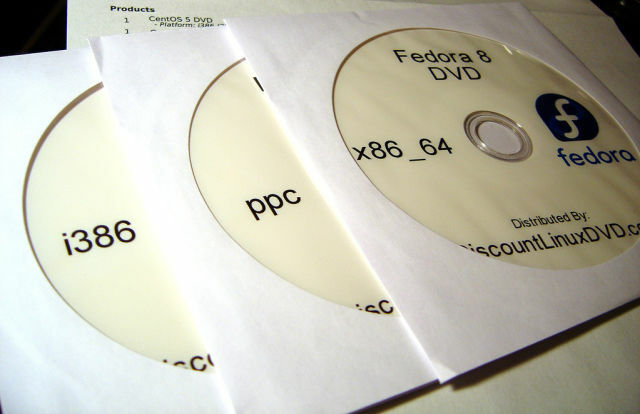 When a player is tied to one music store and one DRM format, you can’t do it. Maybe one of these days this will be a thing of the past and our descendants will look at us like we were crazy for using DRM (along with many, many other things).